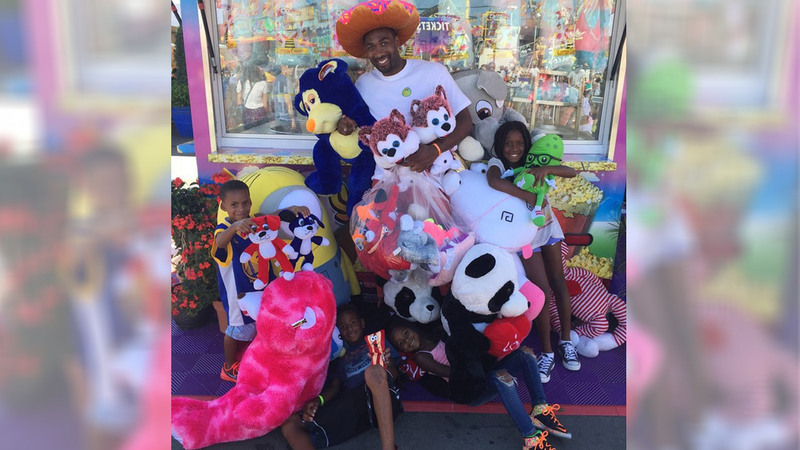 COSTA MESA, Calif. -- Former NBA star Gilbert Arenas went to the Orange County Fair and dominated all the basketball games. On Sunday, he posted a photo on Instagram, claiming he got banned after winning too many prizes. "We just got banned from all the basketball hoops at #orangecountyfair...every one screamed #theRimsarebent I screamed #hibachi ...#ArenasFamily #CountyFairRockstars," he wrote. Carnival operator RCS and O.C. Fair officials say Arenas was not banned, but did win the daily maximum number of prizes from the game, which was one prize per day at each game. "I'd say he looks pretty happy in the picture. Makes me wonder how he got all that home? Mr. Arenas is welcome back that O.C. Fair any time and that includes the basketball games," said Chris Lopez, vice president for RCS. Arenas was a talented shooter in his heyday, averaging nearly 21 points a game over his NBA career.